The Danbo Brothers caroling in the neighbourhood. Who knew the Danbo Brothers could sing? Tonight, they joined forces with a couple of choir mice who come around here every year to carol and they spent a glorious evening singing their little hearts out around the neighborhood. All those small voices blended together perfectly and, I have to say, they sounded very sweet, even if a bit squeaky. 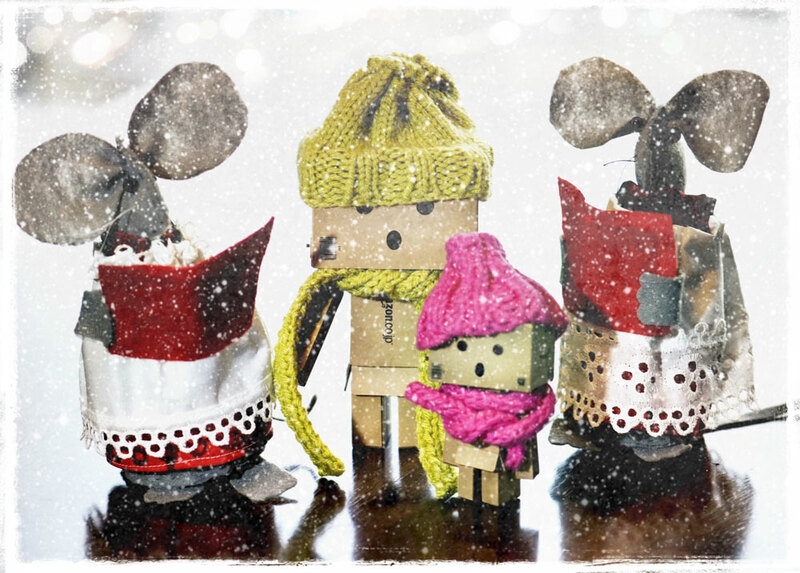 Posted By: madlyinlovewithlife	Category: The Danbo Brothers, Whimsy & Fun	Tags: Amazon Box Characters, Amazon Box Figures, Amazon Box Robot, Big Danbo, Caroling, Choir, Choir Mice, Christmas, Christmas Caroling, Christmas Carols, Creative, Danbo, Danbo Brothers, Danboard, Danbos, Fanciful, Fun, Happy, Happy Holidays, Humor, Humour, Imagination, Inspiration, Inspiring, Knitted Hats, Knitted Scarf, Knitted Scarves, Knitted Toques, Knitting, Lighthearted, Little Danbo, Photograph, Photography, Playful, Quotes, Scarf, Scarves, Sing, Singing, Snow, Snow Day, Story, The Danbo Brothers, Toque, Toques, Whimsical, Winter, Winter Snow, Winter Woolies, Writing, Yotsuba&!